Make Music with Devo. Special release price for a short time only! 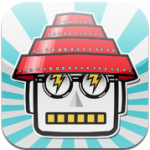 Authorized DEVO Synthesizer and Robot Avatar Maker App, DEVOBOTS is finally HERE. 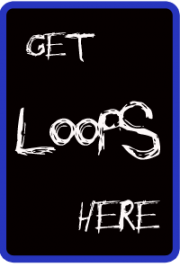 We made our own iPadLoops.com DevoBot check him out. 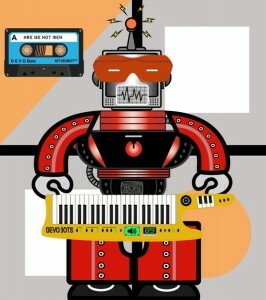 Kit Robot has been working in collaboration with pop icons DEVO for the last year to bring you this exclusive App featuring unreleased Sound Loops from the 1980s Devo Archives, allowing you to play and mix your own music using our unique DevoBots loop synthesizer. Inspired by analogue synths and toy organs from the 1970s, we bring you a toy sound device reminiscent of DEVOs own synths utilizing their very own sound. DevoBots also includes our Kit Robot Avatar engine combined with unique DEVO color form assets, enabling you to create your very own DevoBot Army! This is the first ever App utilizing one of the most influential bands of the last 40 years, making this the must have No 1 DEVO App. A 2 in 1 App. DevoBots is a digital robot assembly kit, like a digital Lego or Mr Potato Head. The user can create millions of robots out of the box using assets to build your very own DevoBot, mimicking the bands outfits and personas from the past 40 years. DevoBots is also a music synthesizer to use as a unique sound generator for your recordings, or live in a professional setting, by manipulating the sound in realtime to achieve unique music. New Assets and Sound packs will become available through In App Downloads making the app ever evolving and modular. • Play with DEVO competition. Create a track to be featured by DEVO in an up coming release or promo. • Expand the synthesizer by collecting NEW DEVO sound banks as they become available. • create desktop images, posters, Tee shirts using Hi Res Retina output. Kit Robot are proud to be working with DEVO to bring you this unique music and creation Toy.